Here are some important tips to protect your skin, hair, scalp and nails during Holi festival. If not taken proper care the chemical colors can wreak havoc on your skin, scalp, hair and nails. 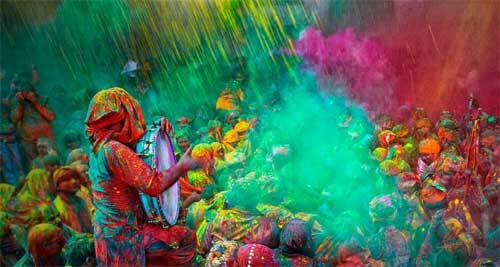 Traditionally, holi was played with natural colors made from herbs, flowers, roots and leaves. They were good for the body. They were beneficial in many ways. But today natural holi colors are replaced with synthetic and chemical colors. Hence it is very important to take care of the body during holi festival. Always use natural holi colours. Use a moisturizer or sunscreen on your face and all those parts that are exposed. Do not leave your hair untied on Holi. Wear thick hairband with a bow or opt for bandana. Use oil or conditioner on your hair before playing Holi. The oil or conditioner will form a thin layer and it will act as a barrier. You can easily remove it with shampoo later. Paint nails with transparent varnish. Keep nails trimmed. If you’re allergic to chemicals, consult your doctor before playing Holi. Avoid water balloons as they can cause injuries. Stay away from Holi Guns as it can cause serious damage to ears and eyes. If there is severe irritation after playing Holi, consult a doctor. Don’t attempt self-medication. Rinse your face with plain water and then use a cleansing cream or lotion. To wash hair, first rinse with plenty of plain luke warm water. Then apply a very mild herbal shampoo. Apply it into the hair and massage the scalp and rinse thoroughly. Apply sesame oil (til oil) helps in removing color. Massage skin with sesame oil and leave it for 15 minutes or so. While bathing, scrub the body gently with a loofah. Then apply lotion. To repair skin, mix 2 tbsp honey with half cup curd, add a pinch of turmeric. Apply this paste on face, neck and arms. Leave for 20 mins and wash off with water. To repair and nourish hair, mix and heat 1 tbsp of castor oil and coconut oil. Apply this on hear. Dip a towel in hot water, squeeze out the water and wrap the hot towel around the head like a turban. Repeat the process 3 times. Wash hair after an hour.